While walking down Greenpoint Avenue recently, specifically that section of the ancient lane which overpasses the massive Long Island Expressway, this “Ghost Bike” caught my attention. Reckless, the political calculations which have caused the Manhattan elites to embrace and encourage cycling as an alternative form of transportation has created several spots where high speed traffic interacts directly with human powered vehicles, and tragedy has ensued. 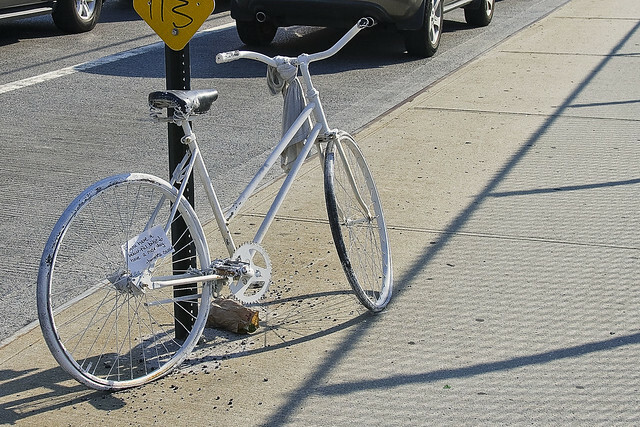 Cycling enthusiasts place these white painted bicycles at the spot where someone has died, as a memorial and a reminder to passerby. 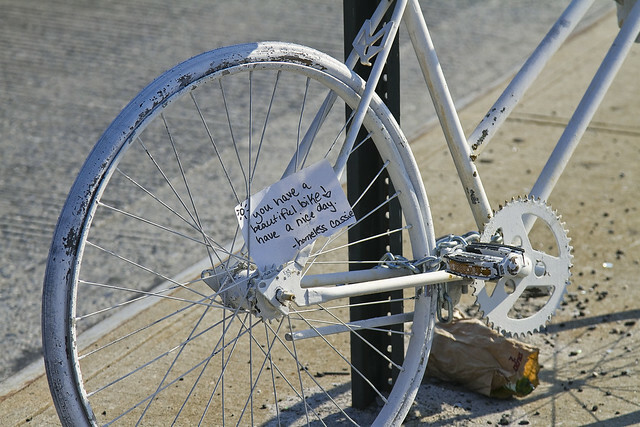 It’s kind of a somber thing, these white bikes. 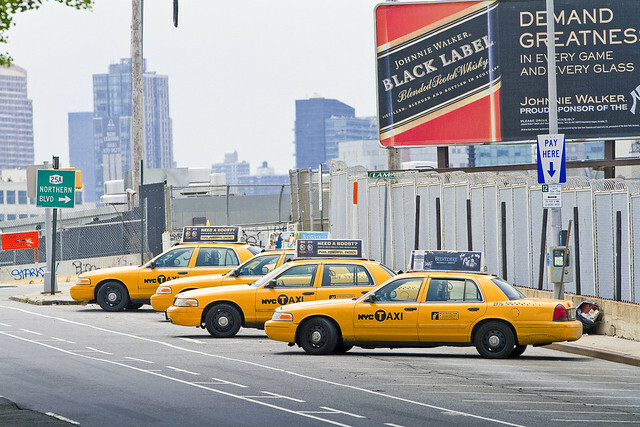 A livery cab driver struck and killed a cyclist in Long Island City early this morning, as first reported by DNAinfo. 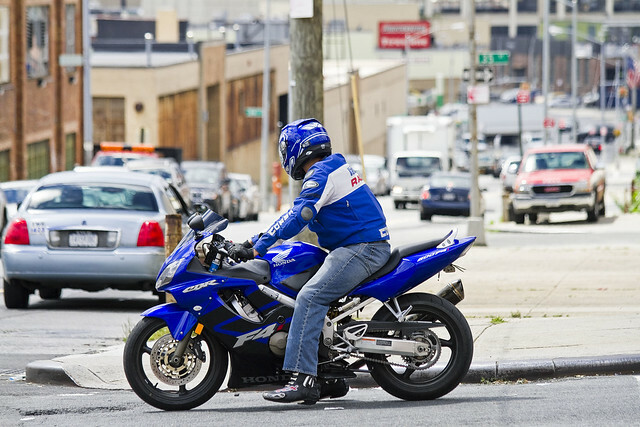 The motorist was not charged with any crime, said an NYPD spokesperson. This post won’t be debating the efficacy of such alternative transportation, the wisdom of allowing vehicles to operate on the streets of New York City (motorized or human powered) without insurance or tags or operator training or licensing, or comment on the tremendous amount of traffic focused on and through Western Queens. 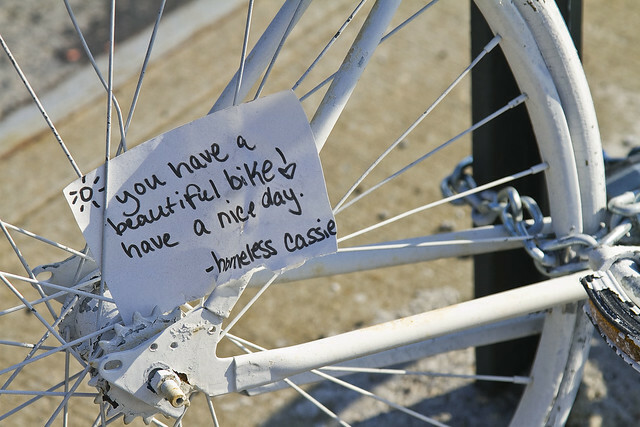 Instead, my attention was drawn to the slip of notepaper which was inserted into the spokes. The currently undefended border of Brooklyn and Queens, and the place where the Industrial Revolution actually happened, provides a dramatic and picturesque setting for this exploration. We’ll be visiting two movable bridges, the still standing remains of an early 19th century highway, and a forgotten tributary of the larger waterway. 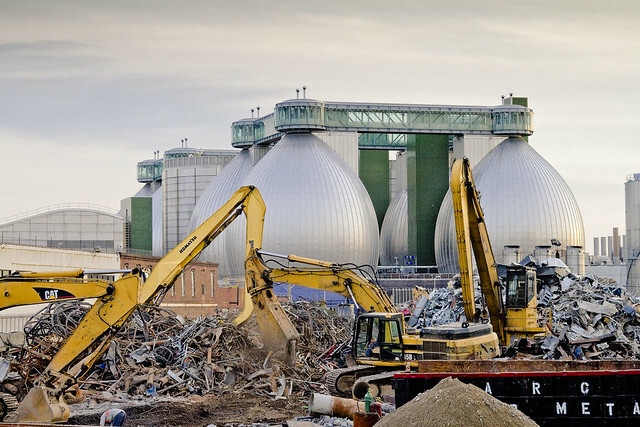 As we walk along the Newtown Creek and explore the “wrong side of the tracks” – you’ll hear tales of the early chemical industry, “Dead Animal and Night Soil Wharfs”, colonial era heretics and witches and the coming of the railroad. The tour concludes at the famed Clinton Diner in Maspeth- where scenes from the Martin Scorcese movie “Goodfellas” were shot. Lunch at Clinton Diner is included with the ticket. Meetup at the corner of Grand Street and Morgan Avenue in Brooklyn at 11 a.m. on August 5, 2012. The L train serves a station at Bushwick Avenue and Grand Street, and the Q54 and Q59 bus lines stop nearby as well. Check MTA.info as ongoing weekend construction often causes delays and interruptions. Drivers, it would be wise to leave your vehicle in the vicinity of the Clinton Diner in Maspeth, Queens or near the start of the walk at Grand St. and Morgan Avenue (you can pick up the bus to Brooklyn nearby the Clinton Diner). Pictured today are the operations of A.R.C. 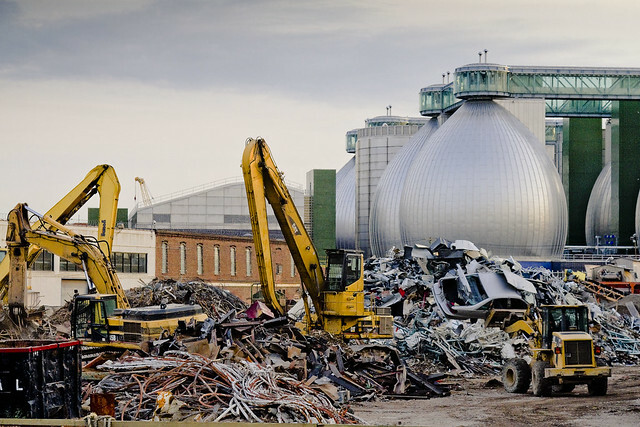 scrap metal division of a corporation called Alloco found at 540 Kingsland avenue in the Greenpoint section of Brooklyn, pictured from a vantage point on the loquacious Newtown Creek. Another former Standard Oil property converted over to modern usage, A.R.C. scrap metal is involved in the recycling trade. I’ve had the privilege of meeting some of the folks who work here, and you couldn’t ask to encounter a nicer bunch of guys. 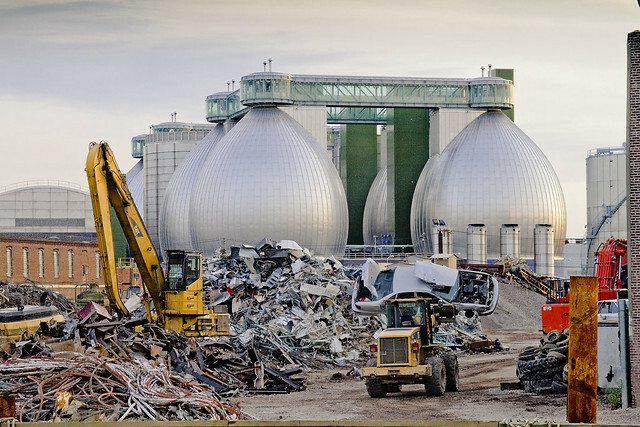 Their yard always displays a frenzy of activity, with heavy equipment sorting through the flow of waste materials and what seems like dozens of safety vested and hard hatted workers laboring away. You may have seen one of these shots before, and apologies are offered for repetition. One is still sorting out problems and playing catch up after the interruption to work flow offered by the lightning strike which disabled much of my equipment. It has been a very, very busy period of time with many unexpected and unscheduled obstacles. Coming home from the Working Harbor Committee Walking tour of the Kill Van Kull yesterday, while onboard the Staten Island Ferry, one of the tour goers pointed out a gargantuan ship passing by and asked me about it. While neither of the ships pictured above and below are that exact vessel, they are of the same class and function. 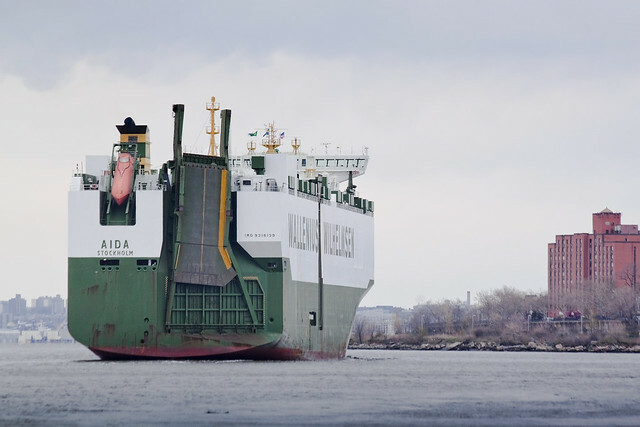 Automobile carriers, they are known to the maritime trade as “Ro-Ro” or “Roll on Roll off” cargo ships, which we’ll be taking a look at this “Maritime Sunday”. Since 1970 the market for exporting and importing cars has increased dramatically and the number and type of RO/ROs has increased also. 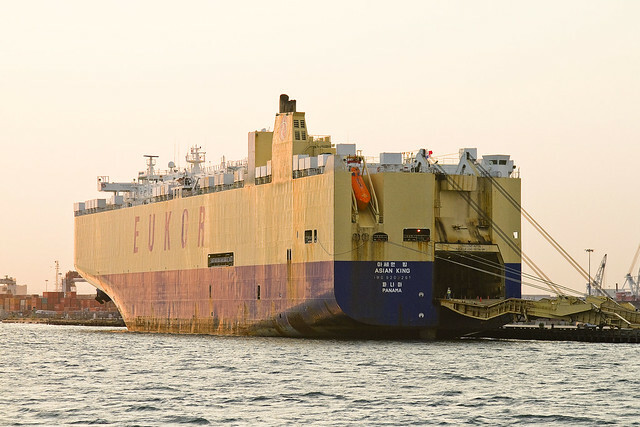 In 1973, Japan’s K Line built European Highway, the first pure car carrier (PCC), which carried 4,200 automobiles. 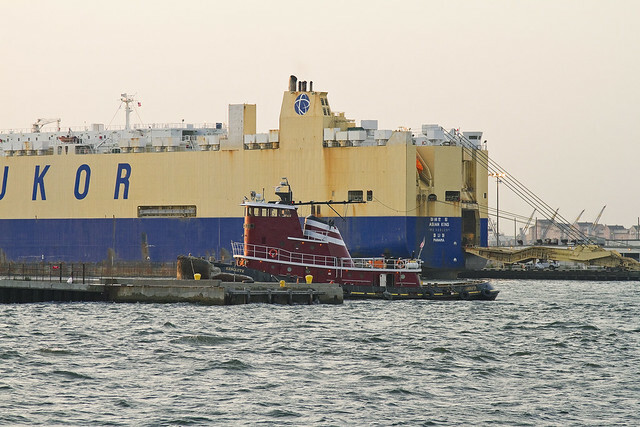 Today’s pure car carriers and their close cousins, the pure car/truck carrier (PCTC) are distinctive ships with a box-like superstructure running the entire length and breadth of the hull, fully enclosing the cargo. They typically have a stern ramp and a side ramp for dual loading of thousands of vehicles (as cars trucks, heavy machineries, tracked units, Mafi trailers, loose statics), and extensive automatic fire control systems. The PCTC has liftable decks to increase vertical clearance as well as heavier decks for “high and heavy” cargo. A 6500 unit car ship with 12 decks can have three decks which can take cargo up to 150 short tons (136 t; 134 long tons) with liftable panels to increase clearance from 1.7 to 6.7 m (5 ft 7 in to 21 ft 10 in) on some decks. Lifting decks to accommodate higher cargo reduces the total capacity. One often spots these gargantua moving slowly about the harbor, most often escorted by at least two tugs. Despite their ungainly appearance, the ships are a great deal more stable than they would appear, or so I am told. Researching this post, tales of Ro Ro ships listing as much as 80 degrees in heavy seas without capsizing have emerged. The economic advantages offered by these vessels, however, far outweigh their risks. Through continuous expansion of our route network, minimization of transit times, utmost attention to cargo-handling quality and a strong dedication to cost savings for our customers, we strive towards delivering total customer satisfaction. Ultimately, we aim to achieve our vision of becoming the best shipping company for the global automotive industry. We combine the best of what Korea and Europe have to offer. Having Hyundai Motor and Kia Motors as shareholders (20%) gives us a unique growth platform within the industry. Add to that the shareholdings of Norwegian shipping company Wilh.Wilhelmsen (40%) with shipping experience dating back to 1861 and leading Swedish shipping group Wallenius Lines (40%)- founded in 1934 and pioneers in car carrier operations since the 1950′s -and we have created a company of world class competencies. The Ro Ro’s, it seems, allow vehicles to be driven onto the ship and then back off at their port of destination. This creates a series of efficiencies when delivering automobiles. Time spent at dock is anathema to shipping companies, and the name of the game is to discharge and acquire new cargo in as efficient and expedient fashion as possible. 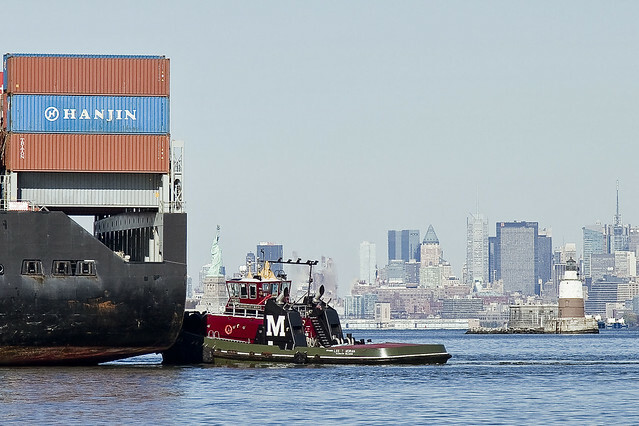 Expediting such matters, and finding solutions to the never ending flow of goods through the port, is what has made New York the 2nd largest port in the United States (although the secondary ranking is something which officials at the Port Authority will argue against, claiming factual rather than statistical primacy over the currently ranked #1 in California). This is less of a link than a crib from emails which have been passed around recently by members of the Working Harbor Committee. The source of the information is undoubtedly “official” but I can’t tell you it’s origin. 3rd largest Cruise Ship port in the U.S. The good news is that the whole Internet access thing seems to be solved for now, and your humble narrator is once more reliably online. 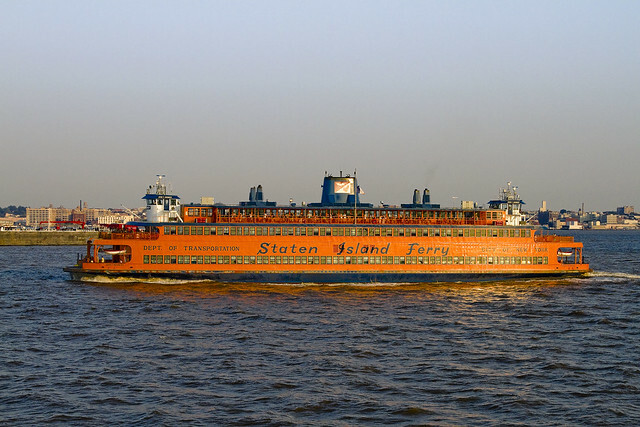 The bad news is that I’m off to Staten Island to conduct a walking tour of the Kill Van Kull instead of doubling down and making up for lost time. Not really bad news of course, as I love doing the whole “reveal thing”, but I am really, really behind on my schedule. 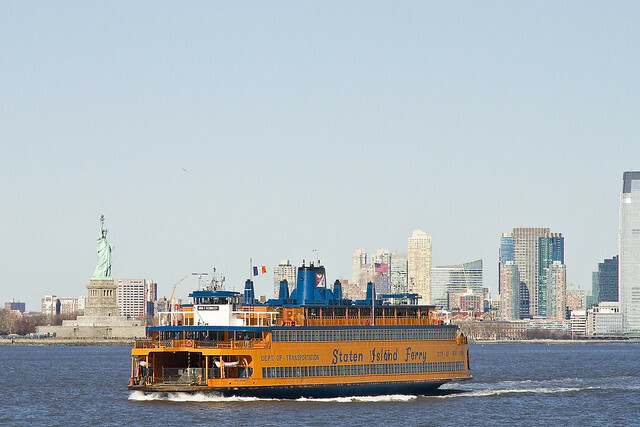 If you care to come along, we will be meeting up on the Staten Island side at 11, nearby the northern exit from the St. George ferry terminal, tickets are $20 per head. Afterwards, I shall race home, or at least move as quickly as New York will allow me to. My plan is to get back to work immediately upon entering HQ. One grows tired and irritable due to this constant state of worry and despair, and looks forward to once again returning to the pure joy of researching, writing about, and photographing the myriad adventures offered within the Newtown Pentacle. Continuing strife related to the lightning damage actually continues today, as that maleficent entity which is called Time Warner Cable continues to frustrate and annoy. The one component that all others rely upon in my little electronic web is unfortunately supplied by this nightmarish and ill mannered corporation, which is web access. Confirmation that everything which might potentially be wired to their equipment for this purpose is functional has been ascertained, and a trip to their Manhattan HQ yesterday consumed three hours of my remaining time on this planet. Upon returning to my HQ in Astoria- one discovered that the replacement modem supplied by this endeavor exhibited the same bizarre behavior as the lightning damaged one. To put it mildly, the customer service representative who I spoke to after this realization got more than a small bit of spleen, and most likely needed a short break for religious reasons. Your humble narrator is not pleased, and wonders why the seeming goal of this company’s customer service stratagems seem to be designed to inspire impotent rage. You can see the helplessness and despair displayed on the faces of their employees, who have the aspect of badly led soldiers used to losing battles. Our Lady scolds my steady invective and mean spirited attitude toward this labor force, reminding me that it’s not “their fault”. If it’s not the fault of a company’s employees that their product is inferior and badly delivered or maintained, then whose is it? Only after a particularly pointed barrage of the purest hatred (expressed by nasty statements about the customer service representative’s paternal heritage), I would point out, that the August 8th appointment they offered me yesterday magically sprang forward to this afternoon. Why not offer the Friday appointment on Wednesday in the first place, rather than risk the ill will engendered? Recently, the United Nations issued a statement adding Internet access to the list of “human rights”. Here in the City of Greater New York, where that institution is housed, this human right is governed, measured, and sold at rapacious rates by a third rate provider. There are certain utility functions- phone, healthcare, electricity, water, cooking gas, heating fuel- considered too important to escape either heavy government regulation or outright municipal monopoly and official franchise. One would like to see data services break out of the 20th century metaphor of an entertainment or telephonic business model, and consequences for malfeasance and incompetence on the part of commercial franchisees added to the municipal play book of regulatory fines. Some day we will look back and laugh, one predicts, at this rat pile of a company which exploited the early days of the digital age. 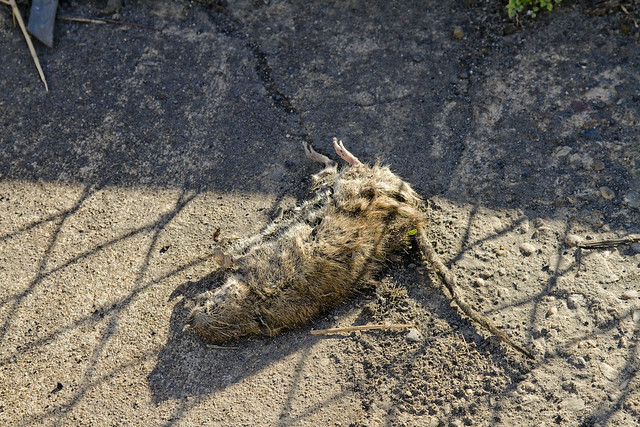 Nearly have I sorted out the various electronic issues caused by the lightning strike which sundered my links with the far flung interwebs, however, the last and greatest hurdle is before me. 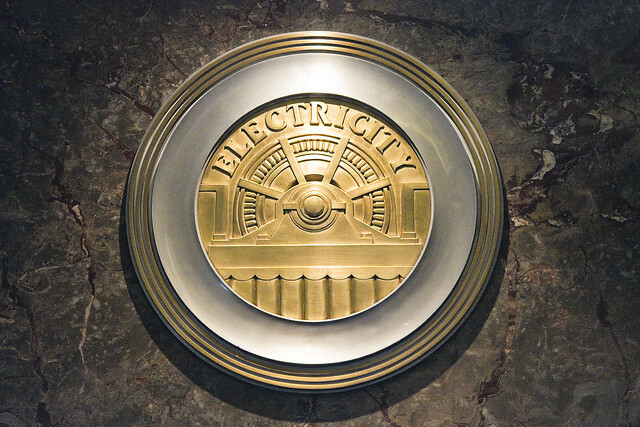 The thundering incompetency and bureaucratic nonsense of the Time Warner cable empire awaits. Long has it been since I severed my relationship with them regarding the delivery of televisual and telephonic service, a second rate and badly delivered suite of offerings at best, but they remain the only game in town as far as high speed Internet (at least in my zip code). Yes, smaller operations exist, but they largely piggy back onto the Time Warner system in Astoria. Today, I must hie to Manhattan and company headquarters in order to exchange a lightning damaged cable modem. The customer service operator offered me an in home appointment on August 8th, some 14 days from now, so the only way to get this dying elephant to perform its most basic function in a timely fashion is to visit its house and kick it in the trunk. I would point out that DirecTV was here within 24 hours to assess the situation, and had their replacement equipment up and running within 48 hours of the lightning event. Hopefully, by tomorrow, the entire system back at Newtown Pentacle HQ will be functionable again- but this is probably vainglorious hope speaking. With luck, I will be able to start doing “my thing” again within a day or two. Tonight, however, diversion can be obtained at the Flux Factory in LIC. 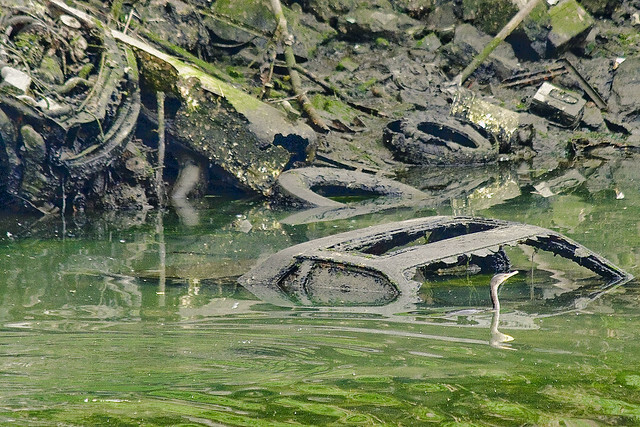 Kate Zidar of Newtown Creek Alliance will be joining Dr. Eric Sanderson for an interesting presentation. Flux Factory is pleased to present the third workshop in a yearlong initiative, The Future of Your Neighborhood: Who Decides? I just might have proof that God hates me. It may have been noticed that my postings over the last week have been somewhat erratic in both content and timing. Normally, the Newtown Pentacle updates on a daily basis, and is scheduled for publication at 12:15 am. Under normal circumstance, this schedule is something I’m quite capable of maintaining, but there are a lot of things in New York City which are beyond ones control. 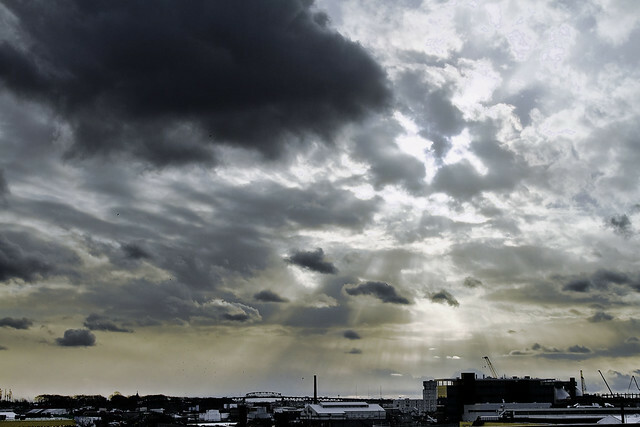 Intermittent outages of internet service, power system irregularities- all are par for the course- but then you’ve got events like the electrical storm which swept through Queens on Wednesday the 18th of July. Working as a freelancer, your humble narrator is often in the home office on any given weekday, which I’ve referred to in the past as “Newtown Pentacle HQ”. 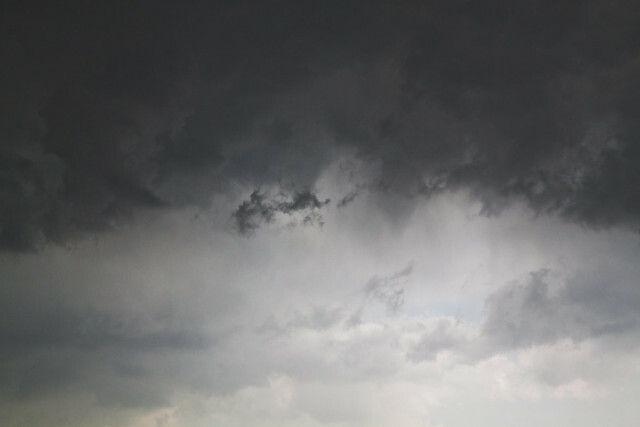 Last week, a heat wave broke and the rain started when a cold front moved in, generating a powerful storm. My little dog, who is quite garrulous and playful, enjoys dancing around in the rain so we stepped outside onto the porch. Within minutes, we both realized that this wasn’t going to be a pleasant shower, but rather a dangerous lightning event. A sudden flash and booming retort put us on notice to seek indoor shelter. 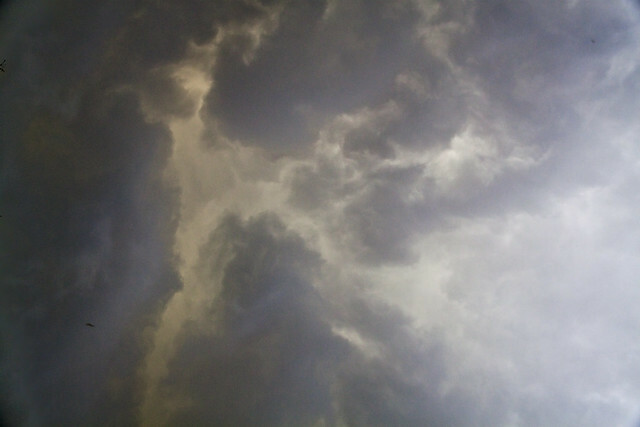 Lightning flashes were occurring every few seconds, and that’s when “it” happened. Out of the corner of my eye, I saw the bolt, and the dog and I both startled as it was mere yards from us. Seeking safety within, I noticed that the standby lights on various electronic devices installed about the house had gone out. After conferring with the neighbors upstairs, who had also lost access to their suite of electronic devices, we realized that lightning had struck the street and that the charge had travelled up and into the building. Casualties of the strike include two televisions, an entire DirecTv setup, a wireless Internet base station- additionally my neighbor’s security camera setup was destroyed (one of the camera units actually appeared to melted). Additionally, the computer, wireless phones, and refrigerator upstairs were also rendered non functional. Restoration of both home comforts and necessary equipment has been ongoing, but has introduced a random and quite expensive series of purchases and tasks into my day to day which has negatively affected my productivity, and accordingly delayed substance and quality of postings here. Apologies are offered- but, as mentioned, God does -in fact- seem to hate me. I’m trying to dig out of the hole, but it may take a few days to catch up.